I'm planning on upgrading to BJC's 10 AWG speaker wire. I'm do for an upgrade and I'm curious to run some blind sound evaluations. I'm planning on banana to banana for amp to speaker and spade to spade for the jumpers. Have I chose the right/easiest set-up for the connectors? Is it difficult making the jumpers with 10 gauge wire with the small length and thickness? 10 ga is going to be stiff, but other than that, bannana's/spades I see no issue. My question comes at what your using now and why you think BJ cables will be an upgrade. 12 or 14 ga should be fine imho. You can even use bare ends for the jumpers if your so inclined. Do you plan on upgrading the interconnects to the amp too ? Plenty of fish in the cable sea, maybe take a look at the sigs of other members and get a grasp of what they are using. I really like the Canare 4s11 better than the 10 gauge when I did a comparison. It is up to you then whether you want to spend the money to go with a biwire configuration or go with single wire and jumpers. 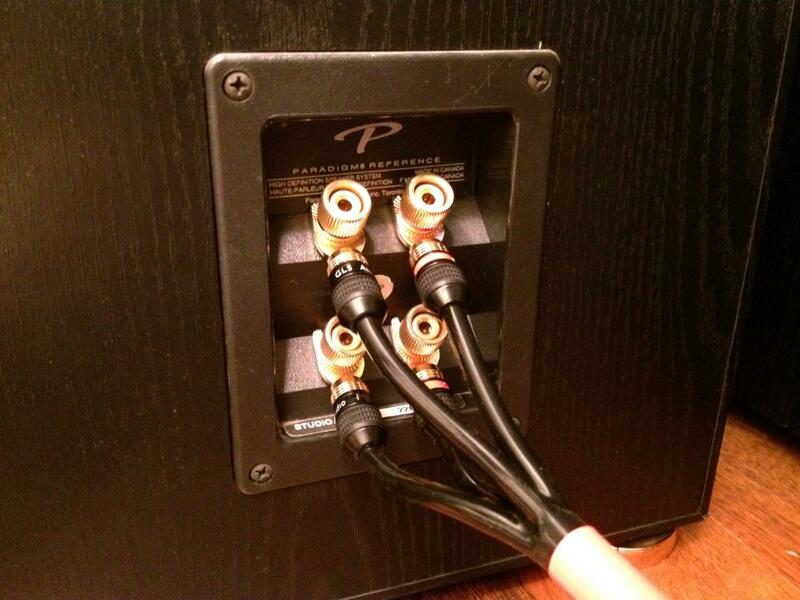 Personally for this level of speaker cables I believe it is fun and rewarding to do DIY. 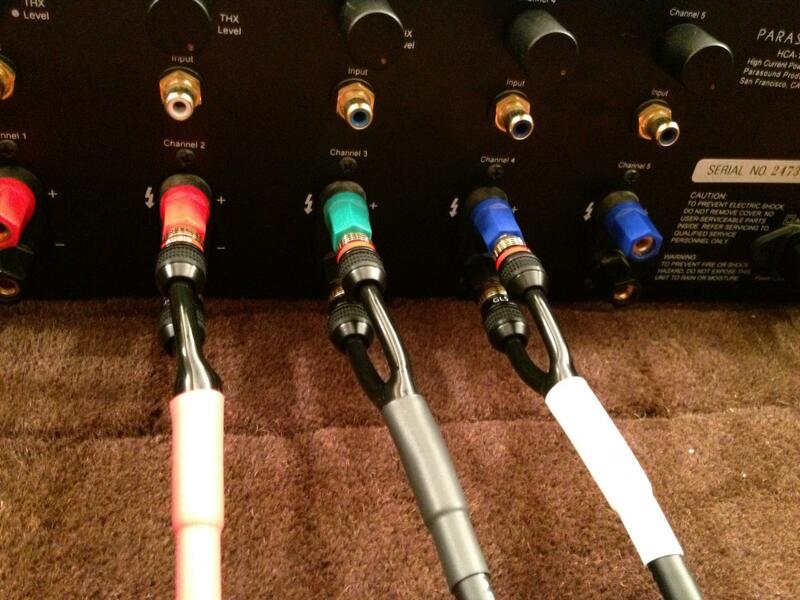 There are several excellent threads on the site detailing the simple process of making speaker cables and then you have a wide selection of colors to make up a nice matching set for your system. Personally I prefer banana connectors and if I am doing spades, prefer those on the amplifiers. At the risk of stirring up trouble, bi-wire your LCR. Use 10* gauge IF it will fit* your bananas to your subs; 12 gauge to your 'A7 tops & 'A6 mids. Internal rewire willl help - 12 ga if you can, 14 if you can't. It's a VERY cheap upgrade in spite of that many will say its a wa$te. I experienced a 3(+)dB increase in output w/a pair of subs by changing speaker wire resistance. "Before:" .019978* ohms. "After:" .0049945* ohms. Your other channels could stand heavier wire. I can already see some winding up with the mud dripping between their fingers. tonyb, I'm currently using economy 16 ga (with bare ends and I made jumpers with spades) I picked up a long time ago at Home Depot. Can't remember the brand. After reading some of the newer posts on cables in general, I'm trying to eliminate any weak links that I may have in my system. After my speaker upgrade I've caught the hobby/enthusiast bug again. In addition, I'm curious to experiment with the cables to actually see if I can hear any difference. If I don't hear a difference, that's fine since I know at least I have a quality set of cables and can look towards the next upgrade. I was leaning towards the 10 ga BJC but I'm still trying to decide between single wire and jumpers or biwire, BJC or Signal. For the interconnects, I purchased Tributaries A2 Silver RCA's that I picked up at the local HiFi shop. Thanks for your advice. Tony (gp4jesus), thanks for your recommendations on both of my posts. Once I have the supplies that I need and the time to experiment, I plan to try your suggestions. When I have the results, I will make sure and reply on my results. Thank you. The Canare cable or Signal cable would be my choice over BJ.....just my opinion, we all start somewhere. I have found DYI cables to be a very satisfying option. I used Canare 4S8 to make bi-wire cables for front left, center, and right channels with GLS Audio bananas and spades. Very flexible and for the price the sound is great. Plus 1 on the Canare. I used 4S11 and liked the results. Thanks for your recommendations. I guess for simplicity and reading numerous threads I decided to go with the Signal Cable bi-wire with bananas all the way around. Frank at Signal was great to talk to, I received the Polk Club discount and the cables arrived fast. Cable aesthetics and construction look great. For my comparison I chose two songs that I'm familiar with and compared my older Home Depot 16 gauge to the new Signals. The first differences I noticed were detail and clarity. To me the midrange and bass seemed tighter and the overall SQ was more pleasing. Next, I ran a few playlists with the new Signals. Detail in songs was definitely an improvement. I started noticing things in songs I really never heard before. But for me the biggest improvement was the improvement in overall SQ. With these playlists and the older cables I would say 70% of the songs sounded very good to 30% OK based on the recording. Don't kill me I'm still streaming MP3's. With the Signals, I would say 95% of the songs sound excellent with 5% as good. I just love the music that is coming out system now and can sit and listen for hours. So overall, I'm very pleased with the purchase. Next upgrade is to convert to FLAC.....starting very soon. Glad you like them man, Frank has been a great guy and supportive of our forum. He has a solid product that I always suggest people start with him over monoprice stuff. Now you have a glimpse at what quality cables bring to the table, it only gets better from here on out. Cruise the digital section and read up a tad, good luck and happy listening. Banana to banana is certainly the easiest and most convenient.